On Friday, December 13th, representatives from Your Selling Team," a business to business call center located in Chadron, surprised each Primary Student with a $2 bill. Giving each student in Grades K-4 money has been an annual event since the business began seven years ago. The students at Chadron Primary would like to thank Your Selling Team for their generosity. If your children have been talking about playing Angry Birds this week, it's probably true! Our students have been participating in the Hour of Code organized by code.org. We have been working on learning coding skills using the computer science tutorials based on games like Angry Birds and Plants vs. Zombies. Kindergarten used the binary coding activity to learn a "secret code" while first grade used a robot as well as Tynker and second grade learned how to move the Angry Birds around at http://learn.code.org/. Students can create accounts at code.org if they want to save their progress and win prizes. January 17th, 2014 has been changed to a full day. January 24th, 2014 will be a 12:00 dismissal. Lunch will be served early on January 24th. Please mark your calendars. The Chadron Primary School Students will begin collecting non-perishable food items beginning on Monday, December 2nd and will conclude the collection on December 19th. In lieu of having students purchase a gift for a gift exchange with their classmates at their class parties on December 20th, students are encouraged to bring food items to put under our Christmas tree. The food items that are received will be donated to a local food pantry and will be distributed to families in the community of Chadron who are in need. The project has been a huge success in the past. As always, your generosity is greatly appreciated. Primary Students Participate in the "Festival of Trees"
Chadron Primary Students have been busy making Christmas ornaments to decorate the tree in the entry way of the Dawes County Courthouse. On Friday, November 22, each student had the opportunity to hang his/her "special" ornament on the tree. This is the second year that the K-2 students have participated in the event. The public is welcome to view all of the trees at the courthouse beginning at their Open House on Friday, December 6, after the "Parade of Lights" until 8:00 P.M. The decorated trees will be available to view until December 27th. Eliana Uhing, daughter of Libby Uhing, a second grade teacher at Chadron Primary School and Willy Uhing, a Chadron High School English teacher, recently participated in and was designated as a winner of a Hometown Hero Contest sponsored by Region I in Scottsbluff. 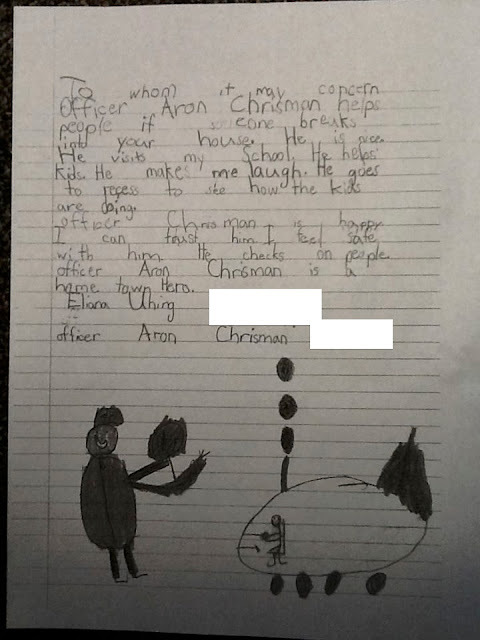 Below is the letter that she wrote about about her hometown hero, Office Aron Chrisman, Chadron Public School's Resource Office. Eliana and "her" hometown hero will be honored at a banquet at the Scottsbluff Elks Club on Tuesday, November 19th. Congratulations, Eliana and Officer Chrisman! Volunteers from the Chadron Fire Department (Jack Rhembrandt, Jake McCrary, Bryan Stolley, Hollie Eiler, and Alyssa Norton) set up 4 stations on October 24th for Primary Students to learn about fire prevention. Topics that the volunteers discussed with the students included how to "Stop, Drop, and Roll," the number to call in case of an emergency, and the importance of developing a family meeting place in case of a fire. In addition, students were allowed to sit inside the ambulance and the fire truck. The Chadron Primary School Students raised an amazing amount of $825 during Pizza Huts' Coins 4 Kids Campaign. The money that was raised will feed 3300 children breakfast, lunch, and dinner for one day. Mrs. Hudson's classroom and Mrs. Landreth's classroom were the winners of a pizza party on October 31st. Mrs. Hudson's students raised $171.56 and Mrs. Landreth's students raised $120.73. The other classes in the competition raised the following amounts: Mrs. Bounous-$80.99; Mrs. Cogdill-$68.15; Mrs. Ferguson-$58.11; Mrs. Gardner-$53.74; Mrs. Hendrickson-$52.28; Mrs. Claussen-49.81; Mrs. Brayton (Schmid)-$47.88; Mrs. Uhing-$40.44; Mrs. Hoffman-$39.55; and Mrs. Fisher-$32.16. Thank you for your generous donations and for helping to feed children across the world. The Primary School Book Fair held during Parent-Teacher Conferences on October 21st and 22nd totaled $2623.86 in sales. The total profit for the school library was $1443.12 or approximately 120 books. Thanks to all of you for supporting our Book Fair. The students really enjoy new books in our library. Chadron Primary P-T Conferences on October 21-22 were well attended. The overall percentage was 89.45%. First grade teachers had the best attendance with 91.38% (Bounous, 84.62%; Claussen, 86.67%; Ferguson, 93.75%, and Gardner, 100%), Kindergarten teachers' attendance was 90.77% (Fisher, 93.33%; Hoffman, 87.8%; Landreth, 88.24%, and Schmid, 94.44%) and Second Grade teachers' attendance was 86.84% (Cogdill, 78.95%; Hendrickson, 90%; Hudson, 94.74%, and Uhing, 83.33%. Thank you, parents, for your participation in the conferences. 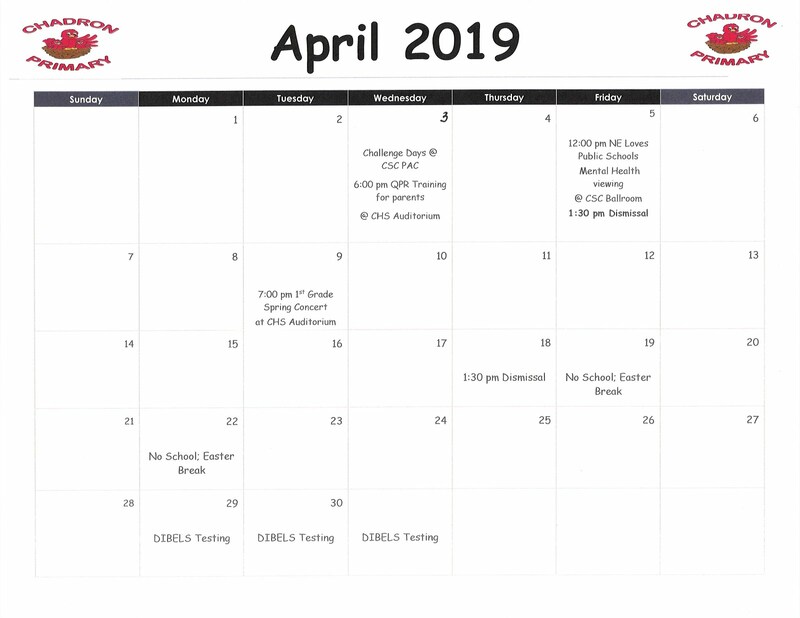 If you were not able to attend and would still like to conference with your child's teacher, please contact the teacher at 432-0710 to schedule a time. Chadron Primary School will hold their first quarter Parent-Teacher Conferences on Monday, October 21st and Tuesday, October 22nd, from 3:00-7:00 P.M. Following is the schedule for those two days. You may come either day at the designated time. Students whose last names begin wit A through K - 3:00-5:00 P.M.
Students whose last names begin with L through Z - 5:00-7:00 P.M. If you cannot come at the time scheduled, please come at anytime on Monday or Tuesday evening. If you cannot come on either evening, please contact your child's teacher(s), and they will schedule a conference at a time that you both agree on. There will NOT be school on Friday, October 25th, for staff and students. Monday, October 21 - from 11:30 A.M. until 8:00 P.M.
Tuesday, October 22 - from 7:45-8:45 A.M. and from 11:00 A.M. until 8:00 P.M. Please come support our school library. The proceeds from the Book Fair are used to purchase books for our students. Chadron Primary School Celebrates "Lights On Afterschool"
On Thursday, October 17, 2013, the Chadron Primary School "Just for Kids" will be participating in the 14th annual Lights On Afterschool, a nationwide celebration of after school programs. After school is key to children’s success in school and in life. Parents, family and community members are welcome to be a part of our local celebration. The Primary School is planning a session on family math and engineering activities for the whole family from 4:30-5:30 P.M. In addition, a light supper will be served in the school cafeteria. Please plan on attending. Over 70 students and over 30 adults participated in the Walk/Bike to School Activity that took place on the high school track on Wednesday, October 9th. Chadron Primary School plans on promoting walking/biking to school by making the walk around the track an annual event. Thank you for walking with us and for encouraging your child(ren) to walk or bike to school on that day. We hope to see more of you next year. The Jump Rope for Heart Campaign is in progress at Chadron Primary School. Your child brought home a packet of information on Tuesday, October 1, with instructions on how to collect donations. The culmination of the event will be on October 23 at 4:00 P.M. at the Physical Activity Center at Chadron State College. This year the American Heart Association has implemented new incentives for the students to solicit donations. With the new incentive called "The Lifesaver Ducks," students have an opportunity to receive six different ducks, depending on the donation which can range from $5-$200. The students will each receive a camo lanyard and the following ducks depending on the donation: Quacky ($5 donation and Quacky Coupon); Sneaky Ninja (the first online donation); Stripes ($35 in any donations); Mr. Cool ($75 in online donations); Glow ($100 in any donations); and Torch ($200 donation). Please consider donating to this worthwhile cause. Adam Gardner, Manager of the Chadron Walmart Store, and Dave Hockenbary, Walmart Zone Manager of Groceries, surprised the certified staff at Chadron Primary School on Friday, September 27th, with a cake and a $50 Walmart Gift Certificate for each staff member in appreciation for the work that they do with the Primary Students. According to Mr. Gardner, two of Walmart's main focuses are education and world hunger. The Teacher Reward Program, sponsored by Walmart, recognizes a group of teachers from an area school each year. This school year, the Chadron Primary staff members were the recipients. Chadron Primary Staff would like to thank Walmart for the gift cards, the refreshments, and for the continued support and contributions that Chadron Walmart gives to our educational systems. To encourage students to turn in the Box Tops that their families have collected, we have decided to start some "friendly" competition between classrooms beginning Tuesday, October 1 and ending October 31. Coming home with your student on September 25 is a sheet on which you and/or your child can paste the Box Tops. If you need more sheets, please have your child ask his/her teacher. The classroom who collects the most Box Tops on October 31 will win a Pizza Party. Thanks for helping with our Box Tops for Education project. Currently we have accumulated $626 in Box Tops. Chadron Primary School was over run by mice on Friday, September 20. However, the mice were so adorable, they were allowed to stay. Upon completion of the story "City Mouse, Country Mouse," and a discussion about the differences between the city and the country, the Kindergarten students and their teachers celebrated by completing a costume in their art class, by eating blueberry pop tarts, string cheese, and juice (just like in the story), and by enjoying the movies "City Mouse, Country Mouse," and "Stuart Little." The students at Chadron Primary School have been invited to participate in the "Super" Elmo Coloring Contest sponsored by the Student Alumni Council at Chadron State College. The coloring sheets were sent home with your child on Friday, September 20, and will need to be returned by Monday, September 23. Please encourage your child to do his/her best coloring. Three winners will be chosen from each category (K, 1st-2nd, 3rd-4th). The winners will receive a T-shirt and will gave the opportunity to ride in the CSC Homecoming parade on October 5th. Winner will be contacted by phone. Previous winners are not eligible to win. October 9th has been designated as WalkBike to School Day. We realize that it is too far for some students to walk or bike. As a result, the staff at Chadron Primary School has set aside from 7:30-7:50 A.M. to walk around the high school track. We would like to invite all parents, students, and staff to come walk at that time. 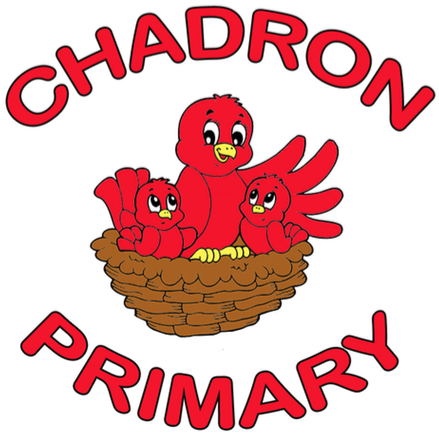 Chadron Primary School is now on Facebook. Chadron Primary School continues to participate in the Box Top and the Campbell's Soup Labels's for Education Programs. Your child's teacher will send home a blank sheet each month on which you can paste the Box Tops that you have collected. When the page is filled, please send it back to school with your child. Please make certain that the Box Top has not expired, as the company will not accept them. Each Box Top is worth $.10 in cash. We have already submitted over $200 in Box Tops. In the past, the money has primarily been used for our end of the year activities for our students to purchase prizes, pizza, etc. Thank you for your contributions. We are in the process of creating a page on which you can also paste Campbell's Soup Labels for Education E-Labels. When the page is filled, please send it back to school with your child. We will send home new sheets periodically, but not necessarily one each month. The E-Labels are each worth 1 point and are used to order items from the Campbell's Soup Catalog. We have primarily used the labels to purchase playground equipment. Thanks for collecting these labels. NEW LOCATION WILL BE ST. PATRICK'S FIELD AT 3RD AND SPRUCE. The Chadron Chapter of the Knights of Columbus will be hosting their annual Punt Pass and Kick Contest on Sunday, September 22, 2013. Sign up is at 1:00 and competition begins at 2:00. The competition is free to boys and girls ages 6-15, as of 12-13-13. A birth certificate or baptisimal certificate is required upon registration along with a parent/guardian signature. For questions or more information, please contact Russ at 432-2003 in the evenings. School will be dismissed at 1:30 on Friday, September 13th. Please pick up your children at that time or make arrangements for someone else to pick them up. We have had a lot of children not picked up at the early dismissal time. Please sign up for Mrs. Alcorn's Remind101 to get a reminder about early dismissals. If you or your other contacts are not available by phone to remind that your child is still at school, we have no recourse except to call our School Resource Officer and have him take your child down to the Police Station. Please keep in mind that early dismissals are for the purpose of staff meetings and or trainings and that staff are required to attend. This includes the principal and the secretary. Ms. Michelle Carlson presents plaque to Mrs. Linda Rishcling for Chadron Primary School. Michelle Carlson, a Nebraska Jump Rope for Heart Association Youth Market Director, presented an award to Chadron Primary School for its contribution of $6,525.89 during the JRFH Campaign in October of last school year. The Primary School was the #7 Top Fund Raiser in the Central and Western Nebraska Region. According to Ms. Carlson, the American Heart Association is implementing a new incentive for fund raisers to celebrate 35 years of partnering with schools and to make their impact on saving lives known. With the new incentive called "The Lifesaver Ducks," students have an opportunity to receive six different ducks, depending on the donation which can range from $5-$200. The students will each receive a camo lanyard and the following ducks depending on the donation: Quacky ($5 donation and Quacky Coupon); Sneaky Ninja (the first online donation); Stripes ($35 in any donations); Mr. Cool ($75 in online donations); Glow ($100 in any donations); and Torch ($200 donation). Stay turned for details. Typically, Mrs. Rischling starts the Jump Rope For Heart Campaign sometime in October. Life Touch will take pictures of the Primary Students on Thursday, September 5th, beginning at 8:00 A.M. Picture envelopes with the picture package choices were sent home on Monday, August 26th with the students. If you are interested in having your younger child(ren)'s picture taken, you may have that done beginning at 7:30 A.M. on September 5th. Additional envelopes will be available in the School Office. You must fill out a separate envelope for each child. Chadron Primary School started a new year with two hundred four students. There are sixty-eight Kindergarten students, fifty-seven First Graders, and seventy-nine Second Graders. We welcome several new faces to our school community from Arizona, Colorado, and Wyoming. The Open House at Chadron Primary School was very successful. One hundred twenty families were represented. Parents and students visited the classrooms and conversed with the classroom teachers. Each student was given the opportunity to locate his/her desk and cubby/locker and put their school supplies away. Parents also had the opportunity to sign up for the "Just for Kids" After School Program which began on Tuesday, August 20th. Chadron Primary School will host their Open House on Wednesday, August 14th, from 6:00-7:30. Parents are encouraged to bring their Primary Students to view their classroom, to meet their new teacher, and to put their school supplies in their assigned desks. Chadron Primary School welcomes 71 Kindergarten students, 64 First Graders, and 80 Second Graders. Eighty-two of the students are new to Chadron Primary School. This number includes the 71 Kindergartners. We would like to welcome all of you to the new school year. We hope that it is a great one. Parent-Teacher Conferences at Chadron Primary School were held on Monday, March 18, and Tuesday, March 19. Attendance was as follows: Kindergarten - 75% (Fisher-82%; Hoffman-88%; Landreth-94%; Schmid-77%), First Grade - 84% (Bounous-84%; Claussen-84%; Ferguson-82%; Gardner-83%), and Second Grade - 69% (Cogdill-68%; Hudson-78%; Hendrickson-68%; Uhing-63%). If parents still want to conference with their child's teacher, please call that teacher at teacher at 432-0710 and set up an appointment. The results of the Parent Survey in respect to next year's Parent-Teacher Conferences are as follows: Of the 71 parents that took the survey, 46 of the 71 (65%) parents wanted to have two days of conferences with 1:30 dismissals on both those days and 25 (35%) parents wanted to dismiss school for one day and have the conferences from 10:00-6:00 on that day. Thank you very much for attending our conferences and for taking the survey. We appreciate your dedication to your child's education and value your input. Chadron Primary School will host an information meeting for parents of potential Kindergarten students for the 2013-14 School Year. The meeting will be held on Tuesday, March 26, 2013 at 6:00 P.M. in the Primary School Gym. The purpose of the meeting will be to give parents an opportunity to sign their child up for Kindergarten and to obtain information about State and District requirements for enrollment. If parents are not able to attend the meeting, they may call Chadron Primary at 308-432-0710 or Trisha Berry at Chadron High School at 432-0707 to request a registration packet. Kindergarten students will have a chance to meet their teacher and classmates and to visit their classroom on Friday, May 3, from 8:00-11:00 A.M.
Mrs. Jodi Hendrickson assists a student who is ready to test in the Read Naturally Program. Chadron Primary School Students and Staff are delighted to have a Mobile Computer Lab available for their use throughout the school day. The mobile lab of 24 computers can be moved from classroom to classroom to be used by the students when the computer lab is being used for keyboarding and computer class. Currently the lab is being utilized for Read Naturally Reading Fluency practice and for additional writing activities. However, staff will undoubtedly find other ways in which to utilize the lab in their classrooms. Chadron Primary School will hold its Parent-Teacher Conferences on Monday, March 18 and Tuesday, March 19 from 3:00-7:00 P.M. School will be dismissed for students at 1:30 P.M. on both of those days. Parents whose children's last name begins with M-Z are scheduled to come between the hours of 3:00-5:00 P.M. both evenings, and parents whose children's last name begins with A-L are scheduled between the hours of 5:00-7:00 P.M. both evenings. If parents cannot come during the hours in which they are scheduled, they may come at any time during the two evenings or schedule a conference with their child's teacher at a different time. Please plan on attending. We look forward to visiting with you. Mrs. Landreth's Kindergartners show off the hats they made for their Dr. The students at Chadron Primary School celebrated Read Across America and Dr. Seuss' Birthday on Friday, March 1st. In addition to creating "Cat in the Hat" hats to wear throughout the day, students enjoyed many of Dr. Seuss' books. A special treat at 1:00 P.M. was the arrival of thirteen Middle School Students who read Dr. Seuss books to the students in each classroom. Each classroom at Chadron Primary celebrated the 100th Day of School in a different way. Some of the activities in their classrooms included doing 100 exercises, enjoying snacks which included 100 pieces,100th Day art projects, and counting to 100. The students all had a great time showing off their ability to count to 100 multiple times in multiple ways. Students from the Primary Building along with Intermediate students and Fifth Grade Students were invited by Dr. Dave Nesheim, Social Science Professor at Chadron State College, to perform during the Martin Luther King Day Celebration hosted by Chadron State College. CSC students, Job Corp students, and community members began the celebration with a march from Common Cents to Memorial Hall. In addition to speeches from Dr. Randy Rhine, President of Chadron State College, Dr. Dave Nesheim, Social Science Professor at CSC, Brek Brixius, NCAP Community Services Director, and two students from Pine Ridge Job Corp, the elementary students performed three songs, directed by Chris Dickerson, Elementary Music Teacher at Chadron Public Schools. The audience joined in with the singing and listened to the story "Follow the Drinking Gourd," a story about the slaves' escape to freedom via the Underground Railroad, read by Mrs. Dickerson. The students at Chadron Primary returned to school on Thursday, January 3, well rested and in good health. A lot of our students were sick in the weeks before the break; so we're really glad to have them all back. In addition to the students who went to school at Chadron Primary the first semester, we added three new students--one in each grade after the break. We want to welcome them as part of the Primary Family. These students have moved to us from Wyoming, South Dakota, and Wisconsin.